Kyokushin is arguably the first Full-Contact Karate style. Kyokushin Karatekas practice hard sparring with no gloves in order to emulate situations they might encounter on the street as much as possible. The influence of Kyokushin can be seen in the K-1 Kickboxing, MMA Championships, Full-Contact Karate Tournaments etc. Learn more about Kyokushin's history & influence here. Kyokushin (極真) karate, a style of full contact karate, founded in 1956 by Korean-Japanese karate master, Mas Oyama (大山倍達 Ōyama Masutatsu) who was born under the name Choi Young-Eui (최영의). Kyokushin is Japanese for “ultimate truth”. Kyokushin is rooted in a philosophy of self-improvement, discipline and hard training. WHAT IS FULL CONTACT KARATE? Full Contact Karate is a rule based on the exchange of direct strikes, and has it’s origins in Kyokushin Karate, founded by the late Sosai Mas Oyama himself. In this competition, which spreads across the globe, there is no use of protective equipment, and attacks are carried out with bare hands and bare feet, in an environment close to fighting. In the Full Contact Rule, fouls attacks, such as blows to the head with the hand, are considered invalid, and bouts are decided by the difference in damage due to valid punches and kicks. If an opponent falls down due to damage, and is not able to get back up in 3 seconds, it is an Ippon (full point) victory. If the opponent gets back up in 3 seconds, it’s a Waza-ari (half point), and two Waza-ari will amount to an Ippon victory. In the past, the Non Contact Rule, which does not exchange direct strikes, was main stream. In comparison, Full Contact Karate, which does not use protective equipment was considered unorthodox. However, the passion of Oyama Sosai, who was in pursuit of the strongest Budo, became only stronger, and in 1969, he successfully held the 1st All Japan Championship under the Full Contact Rule, at Tokyo Metropolitan Gymnasium. Full Contact Karate gradually spread across the world, and in 1975, Karatekas from all over the world gathered in Japan, and the 1st World Championship was held. It was decided that this World Championship would be held every 4 years, just like the Olympic Games, and the event has made it’s place in the world, as the highest stage to decide the strongest competitor. This is how Full Contact Karate established it’s roots in various countries across the world. The International Karate Organization KyokushinKaiKan built by Sosai Oyama, was reformed as NPO World Karate Organization ShinKyokushinKai, by his pupils who inherited his strong passion. 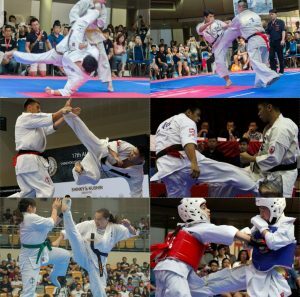 ShinKyokushinKai, which strives to become the “Strongest and Largest Budo Organization”, is continuing it’s activities with the aim of further developing Full Contact Karate, and making Karate part of the Olympic Games. WHAT IS SHINKYOKUSHIN KARATE TRAINING ABOUT? The practice and mastery of Kihon is essential to all advanced training, and includes the practice of correct body form and breathing, while practising basics such as stances, punches, kicks, blocks, and thrusts. Kihon is not only practising of techniques, it is also the karateka fostering the correct spirit and attitude at all times. Kihon techniques tend to be practised often, in many cases during each practice session. They are considered fundamental to mastery and improvement of all movements of greater complexity. Kihon in martial arts can be seen as analogous to basic skills in, for example, basketball. Professional NBA players continue to practice dribbling, passing, free throws, jump shots, etc. in an effort to maintain and perfect the more complex skills used during a basketball game. Kata is a form of ritualized self-training in which patterned or memorized movements are done in order to practice a form of combat maneuvering. Kyokushin kata includes the addition of ‘Ura’ movements on some traditional karate kata. ‘Ura’ means ‘reverse’ whereby a kata is executed with all turns done on spinning movement. This unique kata training was developed by Oyama to aid development of circular fighting technique against multiple opponents. Sparring is an important part of kyokushin training. High emphasis is placed on full contact sparring which is mostly done without any gloves or protective equipment, especially for senior level trainings. Also called kumite, the sparring sessions provides opportunities for the students to practice various techniques in a fighting situation. To achieve Shodan (1st Degree Black Belt) grade, a student has to complete a 20-man kumite test, comprises of twenty 1 minute fight bouts with no rest. In kyokushin, full-contact sparring is considered the ultimate test of strength, endurance, and spirit. Tameshiwari or breaking is demonstrated to test the strength or power of a Karate-ka. Breaking is an action whereby a Karate-ka uses his hand, foot, fingertip, toe, head, elbow, knuckle, or knee to break one or more objects. The most common objects used in kyokushin breaking are thick wood boards, bricks, roof tiles, ice blocks or baseball bats. The Kyokushin system is based on traditional karate like Shotokan and Goju-ryu, but incorporates many elements of combat sports like Boxing, Muay Thai and Kickboxing in the training syllabus. Oyama believed that wearing protective gloves would detract from the realism that the style & training emphasizes. Tournaments are a very important part of Kyokushin. Hundred of Kyokushin tournaments are held throughout the year on every continent in the world, but the largest is held in Japan which is televised on national television. The Kyokushin World Tournament (held every 4 years) is known as the Karate Olympics.